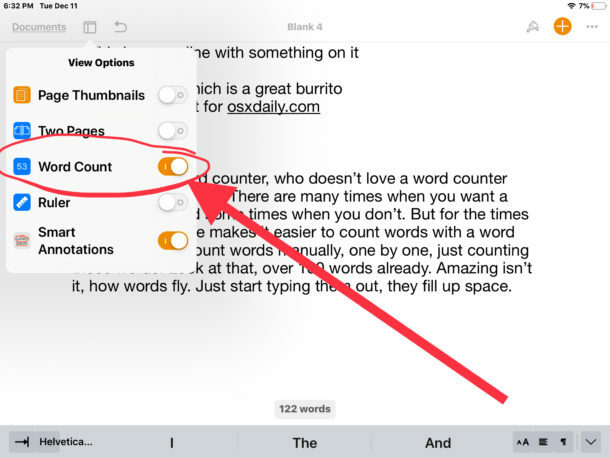 Want to enable a word counter in Pages on iPad or iPhone? The Pages app for iOS includes an optional word count service that will constantly update as you type and edit any document within the Pages app for iOS. Curiously, enabling the word counter on Pages for iOS is different on iPad and iPhone, but this article will show you how to enable the feature in either version. 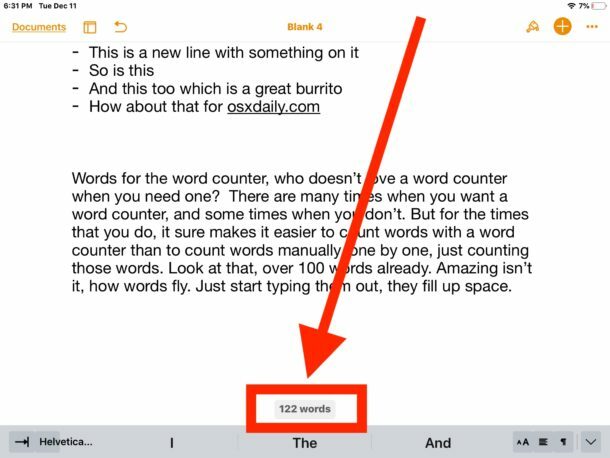 While this may not be useful to all Pages users, many writers, authors, editors, and students rely on word counters for various reasons, and a word counter can help to easily determine the length of a document, manuscript, newsletter, or any other file that may be worked on in the word processor app. The Pages word counter will update automatically as you type, you can test this out immediately by typing or editing any active document in Pages app on iPad. While this covers word count, there does not appear to be an individual character counter in Pages, so you’ll have to make due with the word counter instead. Or if you have access to a Mac, you can always use a character and word counter service in Mac OS that you can make yourself. The above steps are for enabling the word counter on Pages for iPad, but Pages for iPhone also has a word counting service, it just is enabled in a slightly different location in the Pages app for iOS. The Pages app on iPhone also has a word counter that is easily enabled, but for whatever reason enabling it is stored in a different location than on Pages for iPad. 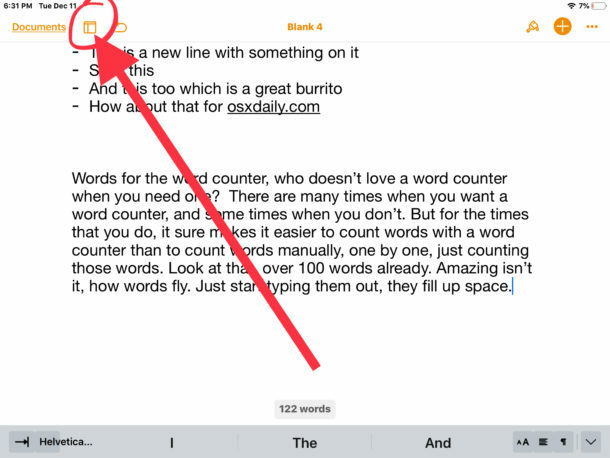 The Pages word counter will appear at the bottom of the iPhone screen when in Pages app, just like the word count tool in Pages for iPad. You can turn off the word count feature by simply untoggling the Word Count option in the appropriate menu on either Pages for iPhone or Pages for iPad. how to show page numbers automatically in Pages as in previous renditions ….. In Pages on my iPhone, I open a document after enabling Word Count as the article suggests. At the bottom of the page it tells me the number of words. Click/tap on that and I have all the different options for counts that I have on my iMac–Characters (no spaces), Characters (with spaces), Words, Paragraphs and Pages. All show their totals for that document. Tap the one I want and that’s what remains on the page after I tap Done. So it is the same in Pages on my phone as on my Mac. Haven’t checked the iPad, but my guess is it will work there as well. Now my question is how to I compare different versions of the same document in Pages. I can do it in Word, but haven’t found or figured out a way to do it in Pages. the same in Windows Office the newst Version. I could open for myself a lot of possibilities with your help.